Well, yesterday dip approach my stop around 2,150 but only to find out the market only came close to do that. Trade still a go, just that now I moved my stop to break even, Stop Loss at 2,180 now. 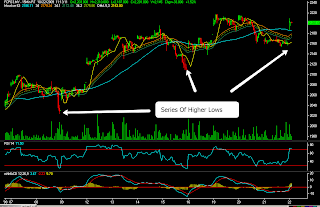 Market manage to create few higher lows, a good indication for a uptrend and Long set up. Moved stop to 2,200 after price reach 2,224. Hit that stop after 2nd trading session, bag 20points for this trade. Let see how the price head after this. 20 Oct: Long @ 2,180, Stop 2,150. Move Stop to 2,200 right after Price reach 2,224. Stop Hit @ 2,200. Close Position.